H&R Block is a popular online tax tool. Straightforward and easy to use, the tax tool helps users search for tax information, answers, articles, and tools they need for preparing and filing their taxes. Whether they are filing their taxes online, in an office, or using H&R BLOCK’s tax preparation software; Tax Information Center can provide them with all they want to know about taxes and the tools that they can conveniently use. Furthermore, the Tax Information Center allows them to access topics that discuss tax deductions, e-filing of taxes, income taxes; IRS tax forms, deadlines, extensions, and letters; tax tips to receive a bigger tax refund, household budget management, saving for a college education or retirement, and business taxes. One of the interesting tools that users can access from the Tax Information Center is the W-2 Early Access. This tool enables employees to obtain electronic copies of their W-2 forms from any local H&R BLOCK office. Thus, instead of waiting for their employers to email them their W-2 forms, they will be able to receive their W-2 at an earlier date. Because of this, they can file their tax returns and receive their refund as soon as possible. Another great tool offered by the Tax Information Center is its ACA Calculator. ACA stands for Affordable Care Act. ACA requires most Americans to have a health insurance; otherwise, they have to pay a penalty tax which is calculated based on income, family size, and other factors. However, there are some groups that are exempted from the penalty tax. Therefore, this tool allows users to determine how ACA impacts their taxes. By answering questions provided by the tool, users will be able to calculate their taxes in relation to the requirements of ACA. The Tax Information Center also offers a tool called Tax Prep Checklist. This tool enables them to identify the items they need as they prepare their tax return. They have the option to either create a custom tax checklist by answering few questions or print the full tax checklist available in the software. 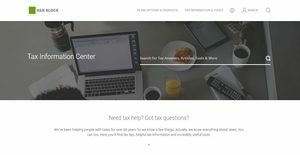 Meanwhile, the Tax Information Center offers tax articles and topics that provide important information and tips to users. For instance, they will be able to know if a rental property will place them in a different tax bracket; or if they have a side job, they will be able to determine if they owe taxes due to such job. These are some topics that users can read from the Tax Information Center. If you are considering H&R Block it might also be a good idea to investigate other subcategories of Best Tax Software listed in our database of SaaS software reviews. There are well-liked and widely used solutions in each software category. But are they automatically the best fit for your company’s unique needs? A trendy software solution may have thousands of customers, but does it offer what you require? For this reason, do not blindly spend on popular systems. Read at least a few H&R Block reviews and consider the aspects that you wish to have in the software such as the fees, main features, available integrations etc. Then, select a few solutions that fit your wants. Try out the free trials of these products, read online reviews, get information from the seller, and do your homework thoroughly. This exhaustive homework is sure to aid you find the most excellent software platform for your firm’s special needs. We realize that when you make a decision to buy Tax Software it’s important not only to see how experts evaluate it in their reviews, but also to find out if the real people and companies that buy it are actually satisfied with the product. That’s why we’ve created our behavior-based Customer Satisfaction Algorithm™ that gathers customer reviews, comments and H&R Block reviews across a wide range of social media sites. The data is then presented in an easy to digest form showing how many people had positive and negative experience with H&R Block. With that information at hand you should be equipped to make an informed buying decision that you won’t regret. What are H&R Block pricing details? What integrations are available for H&R Block? If you need more information about H&R Block or you simply have a question let us know what you need and we’ll forward your request directly to the vendor.